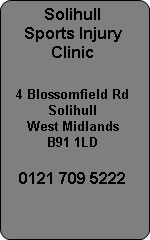 Solihull Sports Injury Clinic treat many athletes and sports people with knee pain. Knee pain can be varied and are given common names such as "runners knee, jumpers knee, housemaids knee" and so on. Physiotherapy in Solihull on your knee is available at our Sports Injury Clinic from one of our Solihull physiotherapists. Inflammation and tendonitis are common injuries around the knee and so to is torn cartilage or menisci. Ligament sprains on the inside of the knee and outside of the knee are plentiful in football and skiing but more serious injury would involve the internal cruciate ligaments which can strain or rupture leaving the knee unstable and giving way. Arthroscopic surgery (keyhole) is now used to repair most knee injuries such as torn menisci and tidying up loose bodies floating around in the knee joint. At Atlas we have access to experienced knee surgeons who perform these proceedures and specialise in sporting knee injuries. Arthritis of the knee can occur in younger sports people but is generally confined to the older generation. Fully weight bearing activity will affect the tibio-femoral joint which is your main weight bearing joint and osteoarthritis can also affect the patella-femoral joint which is the back of the kneecap which will give pain when climbing up or down stairs. Knee pain in children may be growing pains or Osgood Schlatters Disease which is an overuse condition affecting the front of the knee in youngsters between 11 and 14years old generally. It mostly affects boys who are active in sport and although painful it can be managed successfully until the growing has stopped and ossification of the growth plate just below the knee is complete. Runners are prone to knee pain and long distance runners like marathon and half marathon runners will develop knee pain if they have biomechanical problems. Patella tracking issues will soon cause a wearing of the back of the kneecap and give pain. Evidence of this would be pain on going up and down stairs and a cracking or grinding sound when performing squats.